The 800kgs of cocaine detected at the Colombo Port yesterday morning (09) is the largest haul of cocaine detected in the South Asian region, Police said. 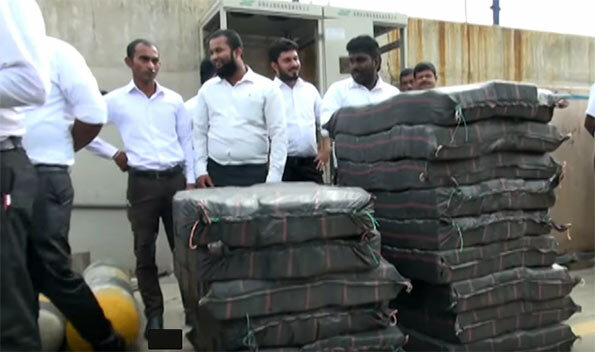 The 800kgs of cocaine is believed to be worth about 12 billion Sri Lankan rupees. The Police Narcotics Bureau had detected the haul yesterday morning, on a ship en route to India from Ecuador. It is unfortunate that we can do little with this 800 kilo consignment of cocaine. Since arujuna or his brother cannot really plug this conduit of illicit trafficking the best that can be done is to turn a blind to jawarama and get some insight to the operation and run as an offshore operation into this trillion dollar operation. The government should provide incentives to promote the cultivation of Cannabis on the pretext that it is cultivated for the fiber. Further Morocco is probably the only place that produces hasish of the finest quality. Morocco according to one source employs around 800000 people producing 10 billion dollars worth of hashish and the demand is expanding. This would make a significant contribution to ranils pet project ….unemployment directly and indirectly setting up mafia to protect the industry.